It was about 1894, when people in the Mojowarno region joined forces to build a hospital. Money had been collected by interested neighbouring companies and Dutch civil servants. The local population, many of whom had been christened by the missionaries of the Nederlandsch Zendingsgenootschap (Rotterdam 1797), was mobilized and voluntarily went into the woods to cut trees and assist in transporting the wood towards the building place. Digging, setting bricks, buiding walls and much more work was executed by the people of Modjowarno and neighbouring villages. The hospital was designed by Ir. S.W. Becking from Modjokerto, a neighbouring town. On the 23rd of March 1892 the Regent of Modjokerto and Djombang, Raden Adipati Kromo Djojo Adi Negoro, laid the first stone and on the 6th of June 1894 the 60-beds hospital was solemnly opened by the same Regent. At this moment, after almost 120 years it still exists at that place. The auxiliary hospital at Pareeredjo (Paree, Kediri) started in 1921 and has a well visited outpatient department, but the bed occupation is disappointing, on average 15. The hospital is situated remote from Pareeredjo and is difficult to access by the dirt roads. The mantri-nurse Moerio is called desa doctor by the people from the neighbourhood and he deserves that name completely, he is the right man in this place; the hospital receives subsidy from the NI Government. The second auxiliary hospital at Ngoro (Djombang) was also founded in 1921. The hospital is owned by the Colonial Bank, but is managed by the Modjowarno hospital. he Bank imposes no limitations to the way the hospital is run. The head mantri-nurse Soepardi has been the leading person from the beginning. In 1933 the average occupation was 32 patients per day and the number of outpatient contacts was 55 per day. The hospital receives subsidy from the NI Government. The auxiliary hospital at Segaran (Delanggoe, Modjokerto) has stopped its services in 1923, when outpatient clinics were founded by the sugar companies in the neighbourhood and the GBZ at Modjokerto was renovated. Sometime later the Eschauzier-concern established a new hospital at Modjokerto, destined for the Javanese. The start of a new auxiliary hospital at Wonosalam is about to be realized. It is intended to nurse tuberculosis patients. The sanatorium will be opened in 1934. This plan has been facilitated by a three year stipend from the Stichting Centrale Vereeniging tot bestrijding der Tuberculose in NI. See A.J. Duymaer van Twist, Verslag van het Zendingshospitaal te Modjowarno 1910. Next to the outpatient departments connected to the auxiliary hospitals there are 4 so-called losse poliklinieken (outer policlinics). Medical checks and administration are organized by the main hospital at Modjowarno. The daily management is in the hands of the mantri-nurses, who coincidentally are married to a midwife. At Soemobito the outpatient clinic was founded in 1925. This clinic too is financially support- ed by a sugar company (the firm Heirs Eilbracht)and housed in a company building. Mantri- nurse Saiman and his wife Prapti run this policlinic from the beginning. The average number of consults is 46 per day. At Kandangan a small policlinic was taken over from the desa on recommendation by the In- spector DVG. Kasnam was the first managing nurse. After his death he was followed by Moenasim. The NIWEM (Water and Electricity Company) financially supported this. In former times there were a few more policlinics, but they are closed. The reason why had to do with the foundation of policlinics in the immediate neighbourhood by the Regency. In this way the policlinics at Toendjoengredjo (Loemadjang) and Poerworedjo (Wates, Kediri) could not be maintained. The one at Bongsoredjo was closed for financial reasons, it was run by the desa, but was situated at to close a distance from the central hospital. The writer memorizes the coming of the second missionary hospital for East Java at Malang, which could be realized with the cooperation of many persons, trained at Mojowarno. In 1927 and 1931 the nurses Hulzebos and Schuurman started community healthcare at Malang and Soerabaja. As they were both midwives, their work evolved to centres of care for women and children. 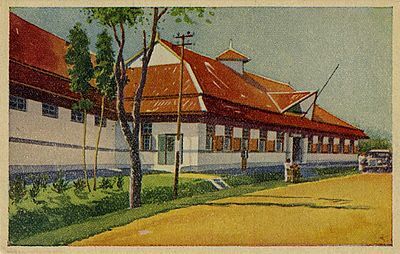 During some postwar years the hospital was used by the Indonesian Army and was called Rumah Sakit Pertahanan Surabaya di Mojowarno (Defense hospital Surabaya of Mojowarno). Nowadays the Hospital is called Rumah Sakit Kristen Mojowarno and is classified Category C. Its address is: Jalan Merdeka no. 59, Mojowarno, Jombang.